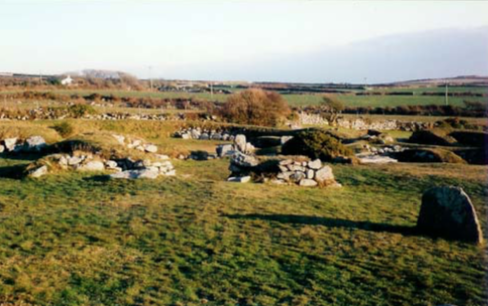 Carn Euny is a fine example of a Courtyard House Settlement, second only to Chysauster [also available as a downloadable leaflet]. Courtyard House Settlements are a uniquely West Penwith form of dwelling, which began to appear at the end of the Iron Age (about 500 BC) and continued to be occupied until the 4th-5th centuries AD (Romano-Cornish period). Each consisted of a small, well-built circular or oval enclosure, generally with a single entrance, usually containing a single round dwelling house and a number of outbuildings set around the periphery of an open court- yard. In the case of Carn Euny however, what eventually evolved from an earlier settlement were four interlocking courtyard houses, each containing a large courtyard, with adjoining spaces. Each house would have been roofed with thatch or turf over a timber framework, and the whole ‘village’ would have been a secure and self-contained unit. The inhabitants worked the surrounding fields, and there is no evidence of any tribal fighting here: the settlement was abandoned peacefully in about the 5th century AD. Carn Euny Courtyard House Settlement can be found near the farmland of Brane, deep in the hidden heartland of West Penwith. From Penzance take the A30 towards Land’s End. About a mile past the B3283 turning to St.Buryan you will see a small turn on your right that leads to Sancreed. [From St.Just take the A3071 towards Penzance and just past the turn to Sennen take the next right to Sancreed]. Near Sancreed take the signed turn northwards to Brane and Carn Euny. There is a small car parking area and then a walk up a lane and across fields to the site, which is managed by Cornwall Heritage Trust. Part of the reason that the site was chosen was because the area all around was once rich in alluvial metallic ores (especially tin, which was a much prized commodity, being necessary for the process of bronze making). Some tin streaming may have taken place here, along with weaving and corn-grinding: pottery and various types of stone tools that were found on the site are indicative of this. However, perhaps the most interesting and significant feature of the site is the presence of an underground Fogou & Beehive Hut.